Situated in the charming Prati neighbourhood, overlooking the Cola di Rienzo square, Caffè Portofino surprises everyone with its great aperitif: one of the most abundant and complete in Rome city centre. At Caffè Portofino you can enjoy a relaxing time with friends after work, taking a break before dinner. Your break is our Aperitif: delightful signature drinks and tasters of the best cocktails, all of which are accompanied by exclusive, delicious appetisers. At Caffè Portofino, customers can enjoy the our outdoor seating area, situated right on the Cola di Rienzo square: ideal during the summer, when you can sit and enjoy the sun and the beautiful days that Rome offers. On the other hand, in winter, the outdoor seating area is furnished with comfortable tables, becoming the perfect place to enjoy an aperitif, since it is covered on three sides and equipped with patio heaters that warm up the surroundings. In short, a great location and a great aperitif in the centre of Rome. What else would you need? Just good food prepared to perfection for all our customers, many of our own products: from cold cuts to cheeses, canapés to rustic pies, croutons to sandwiches. At Caffè Portofino, the appetiser served along with the cocktail is amongst the most abundant and varied. As appetisers you can find many exclusive treats such as assorted sandwiches filled with salmon, shrimp, salted dry beef with rocket, porcini mushrooms, parmesan and salad and, for the most delicate palates, sandwiches with gorgonzola and radicchio. The appetiser also comes with a selection of bread rolls to please everyone’s tastes. From the classic ham with mozzarella, tomato with mozzarella and mortadella with cheese, to those filled with ventricina, artichokes with mozzarella, speck with brie, salted dry beef, trukey and mushrooms with mozzarella for our gourmand customers. Obviously, pizza is also present. Especially the stuffed white pizza: homemade but genuine. The fillings are classic and light but without giving up on pleasure: cooked ham with mozzarella, ham with mozzarella, spinach with mozzarella and tomato with mozzarella. 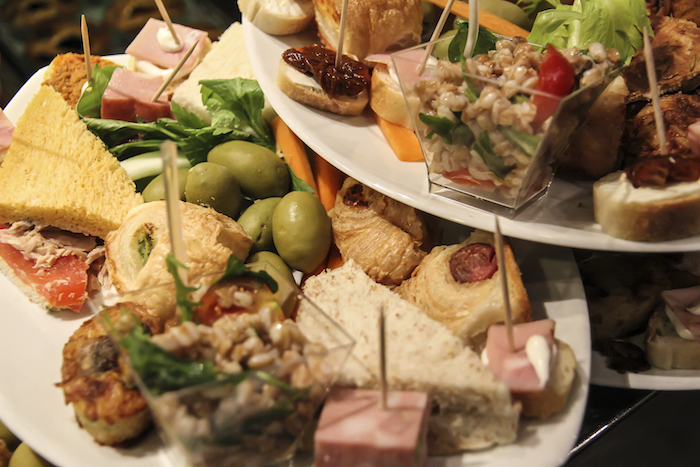 The assortment also includes club sandwiches, toasts, varied canapés and mini bread rolls. All filled with different ingredients. And, if you add the smiles and friendliness of our staff to the good food, you obtain the perfect combination! The aperitif in the centre of Rome is called Caffè Portofino!